BA, MA, Reg Psychol PsSI, F.T.A.I, I.C.P., Dip. N.D.T., H. Dip. Ed. Pascal completed an honours B.A. degree in Psychology (NUI) in 1973 and a M.A. degree in Clinical and Educational Psychology (NUI) in 1974. He is a registered member of the Psychological Society of Ireland (PSI). He worked for over 20 years as a Guidance Counsellor with City of Dublin VEC and in a community school in Tallaght, where he ran special classes for special needs students and also provided Psychological Assessments and Counselling for other students. Over those years he did many courses in counselling, including Gestalt and Rogerian counselling therapies. 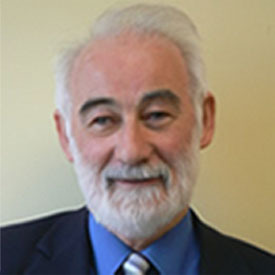 In 1990 -1993 he trained as a Systemic Family Therapist / Psychotherapist and is registered with the Family Therapy Association of Ireland (FTAI) and with the Irish Council for Psychotherapy (ICP). For 17 years he taught a counselling course for The National University of Ireland Maynooth and also supervised students studying the masters in Counselling in Trinity College Dublin and was an occasional lecturer on that course. In the year 1999 he trained in Neuro Developmental Therapy (NDT) in Chester and developed a practice in Dublin; including NDT, Counselling and Psychological Assessments. In 2002 he trained in Listening Therapy in Paris, Washington DC and Vienna in order to offer more positive help to young people with mild to severe developmental delay. In 2003 He opened Cluas, first centre of its kind in Ireland to help young people with Speech and Language difficulties, Dyslexia, Dyspraxia, Auditory Processing Difficulties, ADD/ADHD, Asperger Syndrome and other children on the Autistic Spectrum. In 2011 Pascal was delighted to expand Cluas by opening an office in Cork city. Pascal and his team have worked with 1000’s of children and adults. At Cluas the team includes Pascal – Clinical Director, Ronan Maher – Programme Director and Louise Quinlan – Cluas Consultant Cork.